The good news is that I’m back in my kitchen (phew), and I’ve got the perfect recipe for you to make while trapped inside on a rainy day. In fact, I’d even make this on a sunny day. It’s that good! In true Imperfectly Delicious fashion, there were a few missteps in the kitchen but the result was still wonderful! First preheat your oven to 350 degrees on the bake setting. I tend to be slow in the kitchen, so usually preheat after the receipt is underway, but most of you will want to do this step now. 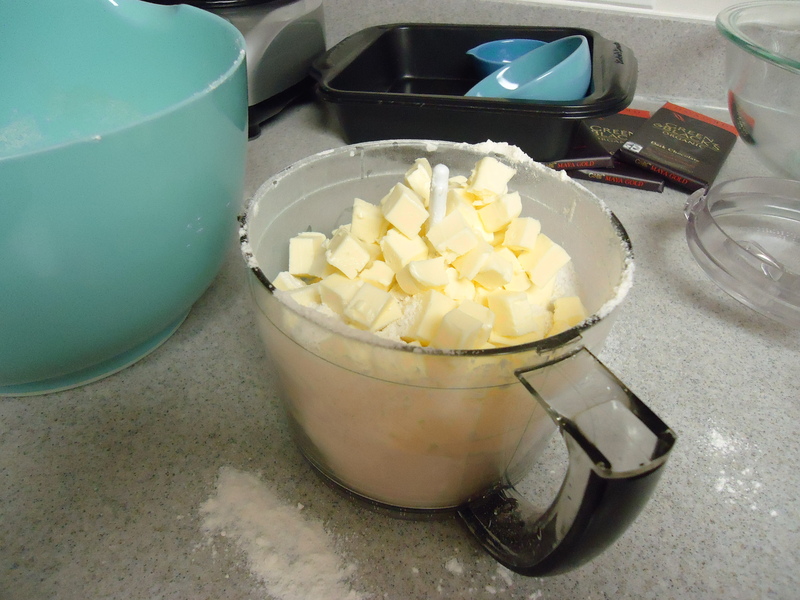 Then start on the shortbread layer by buttering your choice of either two 8 inch nonstick pans OR one 9 x 13 baking dish. I used my 9 x 13 dish because it was clean and easy to find in my new kitchen. 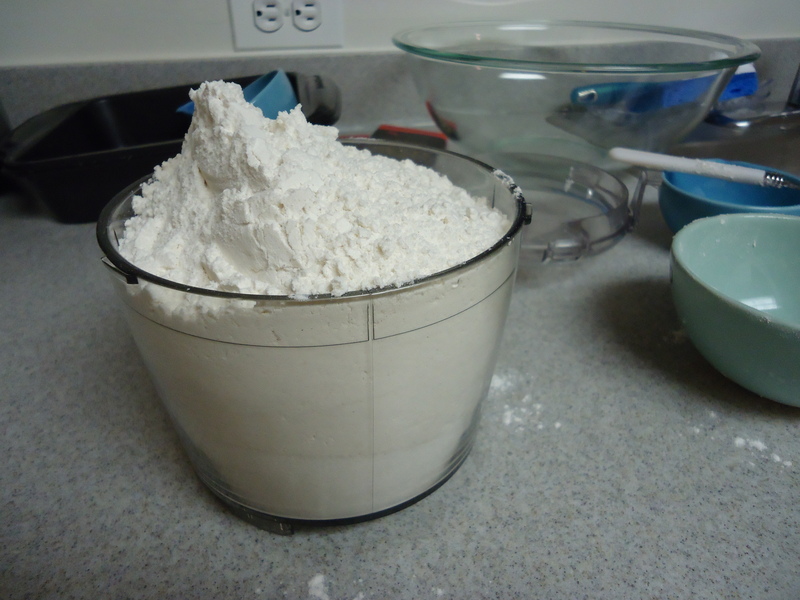 Next combine your flour, sugar and salt in a food processor and pulse once to get them combined. This was when my first error occurred. As you can see I have a small food processor (4 cups size) and ended up having to make the shortbread in two batches because my food processor runneth over. Next add the butter (or half of the butter to half of the mixture if you are like me) and pulse until the ingredients resemble little pea-like balls. Transfer the “peas” from the food processor and press down into the previously buttered baking dish. Bake until the edges of the shortbread turn a light golden brown, approximately 20 mins. The rest of the shortbread will still be pale in color. Cool for 15 mins and start on the caramel layer. 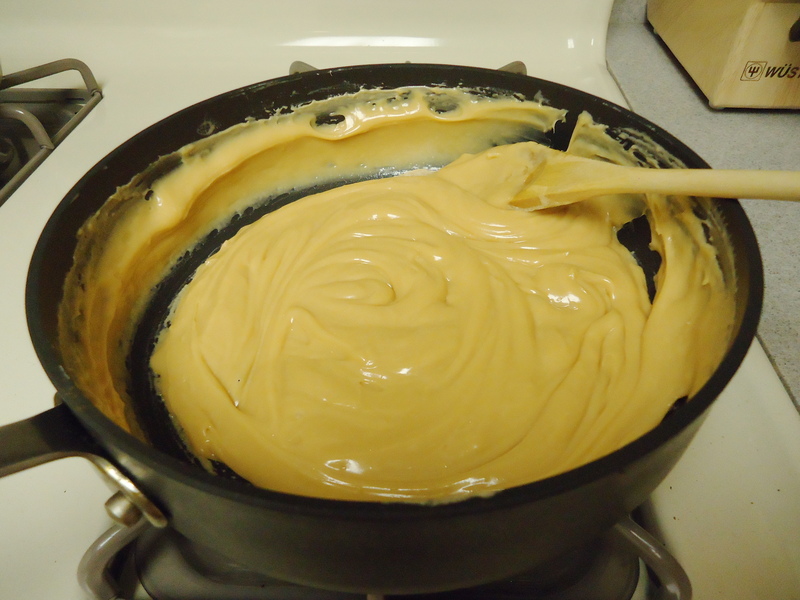 Now melt 2 tbs of butter over medium low heat and add the 2 cans of sweetened condensed milk. 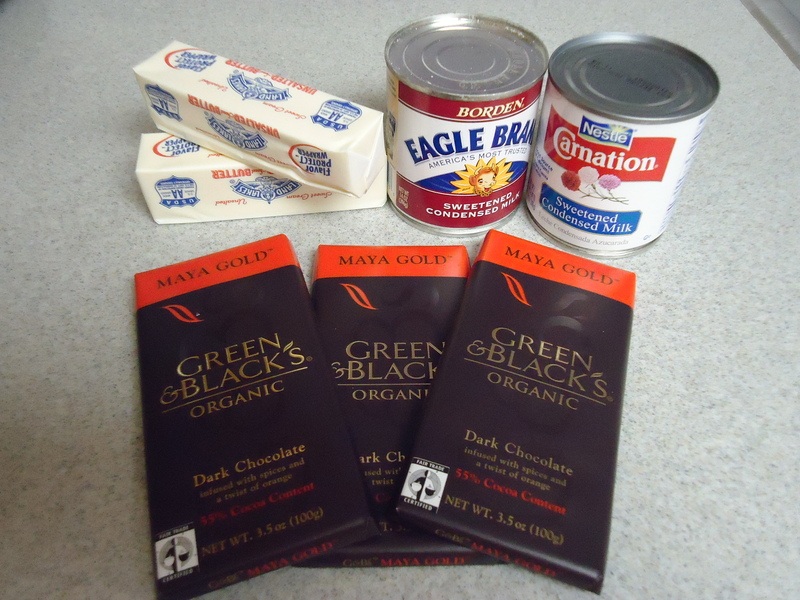 Slowly bring these ingredients to a low boil while stirring the mixture. Stir continuously for about 20 mins or until the color turns a shade of pale caramel. I know it’s a long time to stir, but how often do you get to bake AND workout at the same time? Now that’s my kind of exercise! Pour caramel sauce over the shortbread and let cool to room temperature. Now we move onto the chocolate layer. 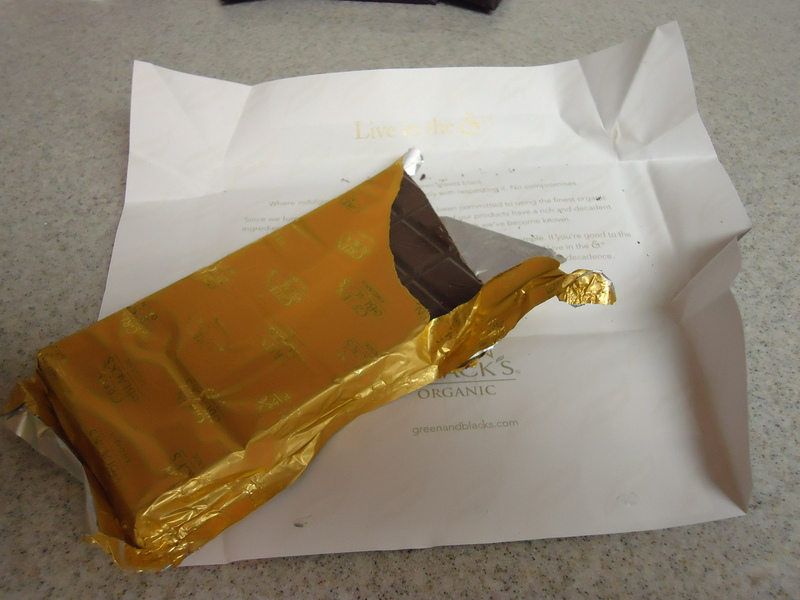 The original recipe calls for good quality milk chocolate. I’m not a big fan, so opted for dark chocolate. Or should I say I accidentally opted for dark chocolate with hints of spice and orange while in the pre-hurricane Whole Foods mayhem. 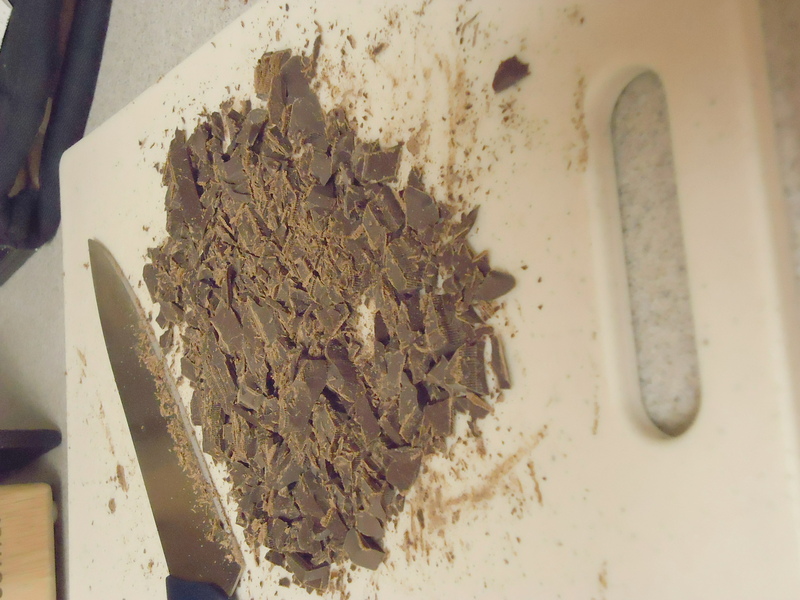 Chop up the chocolate into small chunks and transfer into a glass bowl. Melt chocolate in the bowl over a pot of boiling water. Pour over your caramel layer and sprinkle with flaky sea salt. Let cool for 10 mins before transferring to the fridge. 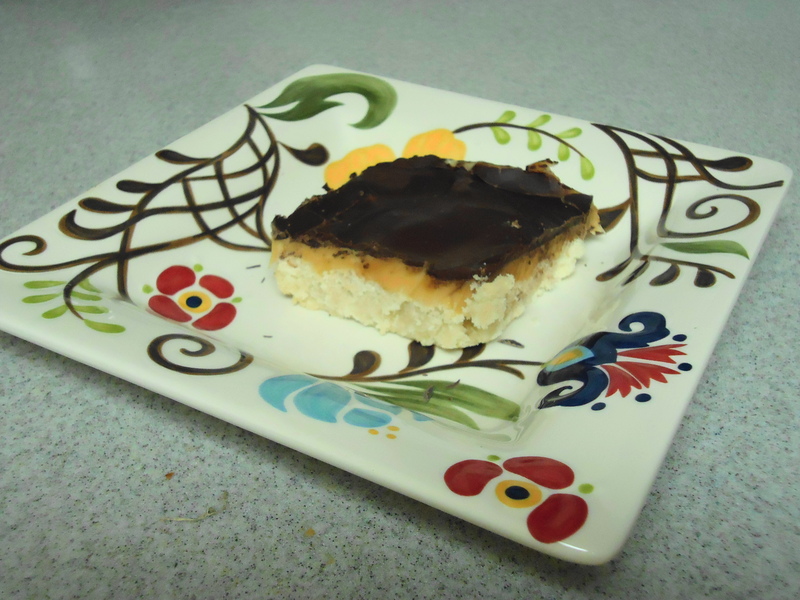 The end result is decadent and buttery goodness. Perfect served right from the fridge with a cold glass of milk, and during your movie or tv marathon of choice!